We offer a wide array of Oversize Load Banners and signs in solid vinyl for Tractors, Trailers and Pilot Cars. If You Can’t Find What You Are Looking For? Go to Request Quote and Submit your information and the item description or product you are looking for along with all the other specific information such as quantity needed, size, color and finish. Upload pictures with your request to assist in identifying items. A Zamzow Customer Service Representative will respond back to you as soon as possible with information about your request. 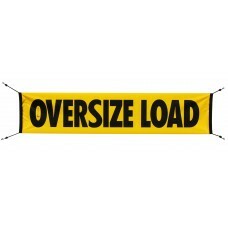 18" X 84" Oversize Load / Wide Load Vinyl Bungee Banner - Truck & Trailer ..